Ever notice when negativity and worry hits your days start horrible and end horrible with everything going wrong around you. I do. With positive thinking day’s can go by without many hitches which can make everyone happier. I admit I love reading self help books, not all of them, most are consistent with the same information. It’s nice to have a couple in my book shelf because every once in a while I open them back up as a reference guide in hard times. And I feel they are needed more and more in this day and age. Especially with the horror of the news and the negative attitude of government and people. My perspective is happiness begins with a positive attitude. When your positive in your own life it radiates out to family, friends, etc., and spreads into the universe. 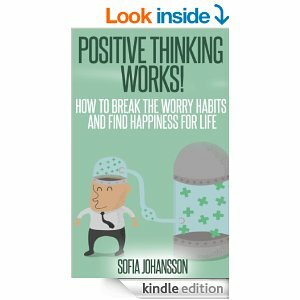 It’s not easy when day to day life bombards you with negative energy, but this book gives great reference points and gives the reader exercises on how to start bringing more positive energy and less stress into your life.